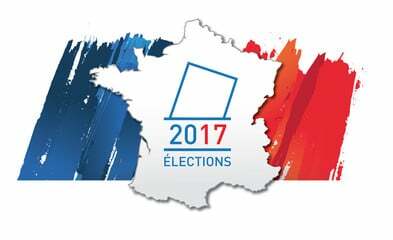 The 2017 French Presidential election marks a profound change in European political alignments. There is an ongoing shift from the traditional left-right rivalry to opposition between globalization, in the form of the European Union (EU), and national sovereignty. Going from there to here is like walking through Alice’s looking glass. Almost everything is turned around. On this side of the glass, the left has turned into the right and part of the right is turning into the left. Fifty years ago, it was “the left” whose most ardent cause was passionate support for Third World national liberation struggles. The left’s heroes were Ahmed Ben Bella, Sukarno, Amilcar Cabral, Patrice Lumumba, and above all Ho Chi Minh. What were these leaders fighting for? They were fighting to liberate their countries from Western imperialism. They were fighting for independence, for the right to determine their own way of life, preserve their own customs, decide their own future. They were fighting for national sovereignty, and the left supported that struggle. Today, it is all turned around. “Sovereignty” has become a bad word in the mainstream left. National sovereignty is an essentially defensive concept. It is about staying home and minding one’s own business. It is the opposite of the aggressive nationalism that inspired fascist Italy and Nazi Germany to conquer other countries, depriving them of their national sovereignty. The confusion is due to the fact that most of what calls itself “the left” in the West has been totally won over to the current form of imperialism – aka “globalization”. It is an imperialism of a new type, centered on the use of military force and “soft” power to enable transnational finance to penetrate every corner of the earth and thus to reshape all societies in the endless quest for profitable return on capital investment. The left has been won over to this new imperialism because it advances under the banner of “human rights” and “antiracism” – abstractions which a whole generation has been indoctrinated to consider the central, if not the only, political issues of our times. The fact that “sovereignism” is growing in Europe is interpreted by mainstream globalist media as proof that “Europe is moving to the right”– no doubt because Europeans are “racist”. This interpretation is biased and dangerous. People in more and more European nations are calling for national sovereignty precisely because they have lost it. They lost it to the European Union, and they want it back. That is why the British voted to leave the European Union. Not because they are “racist”, but primarily because they cherish their historic tradition of self-rule. As his five-year presidency drew to its ignominious end, François Hollande was obliged by his drastic unpopularity to let his Parti Socialiste (PS) choose its 2017 presidential candidate by primary. In a surprising upset, the Socialist government’s natural candidate, prime minister Manuel Valls, lost to Benoit Hamon, an obscure member of the PS left wing who refused to vote for the unpopular, neo-liberal, anti-labor laws designed by Hollande’s economic advisor, Emmanuel Macron. To escape from the unpopularity of the PS, Macron formed his own movement, “En Marche!” One after another, Valls, Hollande and other prominent PS leaders are tiptoeing away, leaving Hamon at the helm of the sinking ship. As Hamon justifiably protests against their betrayal, the party bigwigs pledge their support to Emmanuel Macron. Macron ostentatiously hesitates to welcome his shopworn converts into the fold, fearing that their conversion makes it too obvious that his “En Marche!” is a clone of the right wing of the PS, on the way to becoming the French subsidiary of the U.S. Democratic Party in its Clintonian form. 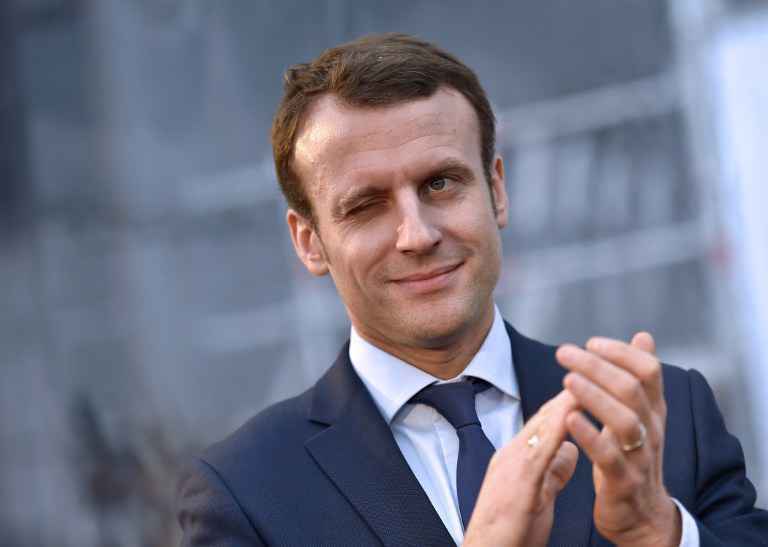 Macron proclaims that he is neither left nor right, as discredited politicians from both left and right jump on his bandwagon, to his embarrassment. Hamon himself appears to be unaware that the basic cause of the Socialist Party’s shipwreck is its incompatible devotion to two contrary principles: traditional social democracy, and the European Union (EU). Macron, Hollande and their fellow turncoats at least have made their choice: the European Union. The great advantage of Republican candidate François Fillon is that his policies are clear. Unlike Hollande, who tried to disguise his neoliberal policies as something else, and based his claim to be on the left on “societal” issues (gay marriage), Fillon is an unabashed conservative. His policies are designed to reduce the huge national debt. Whereas previous governments (including his own, when he was President Sarkozy’s Prime Minister) beat around the bush, Fillon won the Republican nomination by a program of sharp cutbacks in government spending. Fillon claims that his austerity measures will lead French capitalists to invest in France and thus save the country’s economy from being completely taken over by foreign corporations, American retirement funds and Qatar. This is highly doubtful, as there is nothing under EU rules to encourage French investors to invest in France rather than somewhere else. 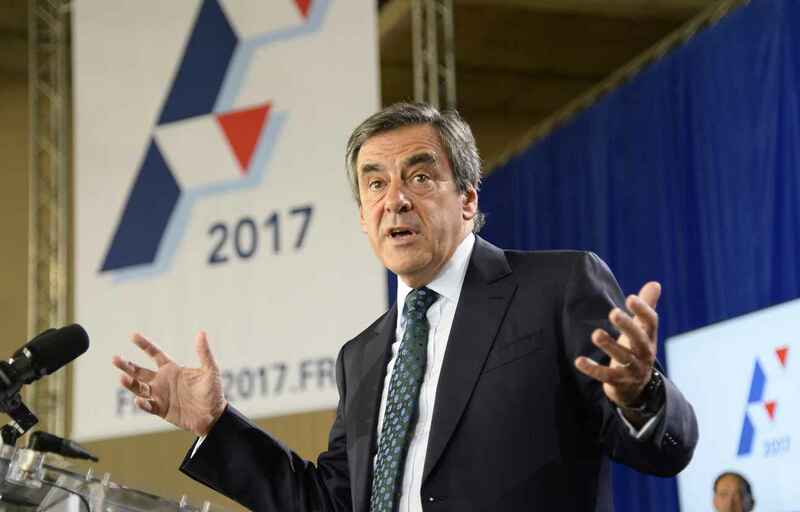 Fillon departs from EU orthodoxy, however, by proposing a more independent foreign policy, notably by ending the “absurd” sanctions against Russian. He is more concerned about the fate of Middle East Christians than about overthrowing Assad. The upshot is that Fillon’s coherent pro-capitalist policy is not exactly what the dominant globalizing elite prefers. The “center left” is their clear political choice since Tony Blair and Bill Clinton revised the agendas of their respective parties. The center left emphasis on human rights (especially in faraway countries targeted for regime change) and ethnic diversity at home fits the long-term globalist aims of erasing national borders, to allow unrestricted free movement of capital. Traditional patriotic conservatism, represented by Fillon, does not altogether correspond to the international adventurism of globalization. For a generation, the French left has made “the construction of Europe” the center of its world view. In the early 1980s, faced with opposition from what was then the European Community, French President François Mitterrand abandoned the socializing program on which he been elected. Mitterrand nursed the hope that France would politically dominate a united Europe, but the unification of Germany changed all that. So did EU expansion to Eastern Central nations within the German sphere of influence. Economic policy is now made in Germany. As the traditional left goal of economic equality was abandoned, it was superseded by emphatic allegiance to “human rights”, which is now taught in school as a veritable religion. The vague notion of human rights was somehow associated with the “free movement” of everything and everybody. Indeed the official EU dogma is protection of “free movement”: free movement of goods, people, labor and (last but certainly not least) capital. These “four freedoms” in practice transform the nation from a political society into a financial market, an investment opportunity, run by a bureaucracy of supposed experts. In this way, the European Union has become the vanguard experiment in transforming the world into a single capitalist market. The French left bought heavily into this ideal, partly because it deceptively echoed the old leftist ideal of “internationalism” (whereas capital has always been incomparably more “international” than workers), and partly due to the simplistic idea that “nationalism” is the sole cause of wars. More fundamental and complex causes of war are ignored. For a long time, the left has complained about job loss, declining living standards, delocalization or closure of profitable industries, without recognizing that these unpopular results are caused by EU requirements. EU directives and regulations increasingly undermine the French model of redistribution through public services, and are now threatening to wipe them out altogether – either because “the government is bankrupt” or because of EU competition rules prohibit countries from taking measures to preserve their key industries or their agriculture. Rather than face reality, the left’s reaction has mostly been to repeat its worn-out demand for an impossible “Social Europe”. Yet the dream of “social Europe” received what amounted to a fatal blow ten years ago. In 2005, a referendum was called to allow the French to approve a Constitution for united Europe. This led to an extraordinary popular discussion, with countless meetings of citizens examining every aspect of this lengthy document. Unlike normal constitutions, this document froze the member States in a single monetarist economic policy, with no possibility of change. On May 29, 2005, French voters rejected the treaty by 55% to 45%. What seemed to be a great victory for responsible democracy turned into its major failure. Essentially the same document, renamed the Lisbon Treaty, was ratified in December 2007, without a referendum. Global governance had put the people in their place. This produced widespread disillusion with politics as millions concluded that their votes didn’t matter, that politicians paid no attention to the will of the people. Even so, Socialist politicians continued to pledge undying allegiance to the EU, always with the prospect that “Social Europe” might somehow be possible. Meanwhile, it has become more and more obvious that EU monetarist policy based on the common currency, the euro, creates neither growth nor jobs as promised but destroys both. Unable to control its own currency, obliged to borrow from private banks, and to pay them interest, France is more and more in debt, its industry is disappearing and its farmers are committing suicide, on the average of one every other day. The left has ended up in an impossible position: unswervingly loyal to the EU while calling for policies that are impossible under EU rules governing competition, free movement, deregulation, budgetary restraints, and countless other regulations produced by an opaque bureaucracy and ratified by a virtually powerless European Parliament, all under the influence of an army of lobbyists. Benoit Hamon remains firmly stuck on the horns of the left’s fatal dilemma: determination to be “socialist”, or rather, social democratic, and passionate loyalty to “Europe”. While insisting on social policies that cannot possibly be carried out with the euro as currency and according to EU rules, Hamon still proclaims loyalty to “Europe”. He parrots the EU’s made-in-Washington foreign policy, demanding that “Assad must go” and ranting against Putin and Russia. France Insoumise, which can be translated in a number of ways, including “the France that does not submit”. Submit to what? Mainly, to the euro and to the antisocial, neoliberal policies of the European Union that are ruining France. French flags and la Marseillaise have replaced the Internationale at Mélenchon rallies. “The Europe of our dreams is dead,” he acknowledges, vowing to “end the nightmare of dictatorship by banks and finance”. 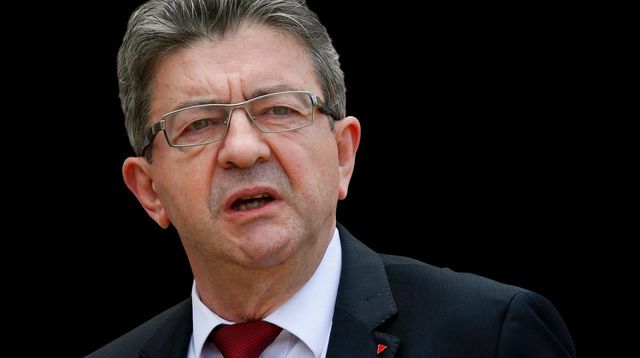 Mélenchon calls for outright disobedience by violating EU treaties that are harmful to France. That is his Plan A. His Plan B is to leave the EU, in case Plan A fails to convince Germany (the current boss) and the others to agree to change the treaties. But at best, Plan B is an empty threat to strengthen his hand in theoretical negotiations. 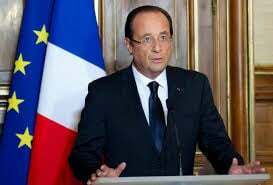 France is such a crucial member, he maintains, that a French threat to leave should be enough to force changes. Threatening to leave the EU is just part of Mélenchon’s vast and complicated program which includes calling a national convention to draft a constitution for France’s “sixth Republic” as well as major ecological innovation. Completely changing both France and the European Union at the same time would require the nation to be in a revolutionary effervescence that is by no means visible. It would also require a unanimity among the EU’s 28 member States that is simply impossible. But Mélenchon is canny enough to have recognized the basic problem: the enemy of jobs, prosperity and public services is the European Union. Mélenchon is by far the candidate that generates the most excitement. He has rapidly outdistanced Hamon and draws huge enthusiastic crowds to his rallies. His progress has changed the shape of the race: at this moment, he has become one of four front-runners who might get past the first round vote on April 23 into the finals on May 7: Le Pen, Macron, Fillon and himself. A most remarkable feature of this campaign is great similarity between the two candidates said to represent “the far left”, Mélenchon, and “the far right”, Marine Le Pen. Both speak of leaving the euro. Both vow to negotiate with the EU to get better treaty terms for France. Both advocate social policies to benefit workers and low income people. Both want to normalize relations with Russia. Both want to leave NATO, or at least its military command. Both defend national sovereignty, and can thus be described as “sovereignists”. The only big difference between them is on immigration, an issue that arouses so much emotion that it is hard to discuss sensibly. Those who oppose immigration are accused of “fascism”, those who favor immigration are accused of wanting to destroy the nation’s identity by flooding it with inassimilable foreigners. In a country suffering from unemployment, without jobs or housing to accommodate mass immigration, and under the ongoing threat of Islamist terror attacks, the issue cannot be reasonably reduced to “racism” – unless Islamic terrorists constitute a “race”, for which there is no evidence. Le Pen insists that all French citizens deserve equal treatment regardless of their origins, race or religion. She is certain to get considerable support from recently nationalized immigrants, just as she now gets a majority of working class votes. If this is “fascism”, it has changed a lot in the past seventy years. What is significant is that despite their differences, the two most charismatic candidates both speak of restoring national sovereignty. Both evoke the possibility of leaving the European Union, although in rather uncertain terms. The globalist media are already preparing to blame the eventual election of a “sovereignist” candidate on Vladimir Putin. Public opinion in the West is being prepared for massive protests to break out against an undesired winner, and the “antifa” militants are ready to wreak havoc in the streets. 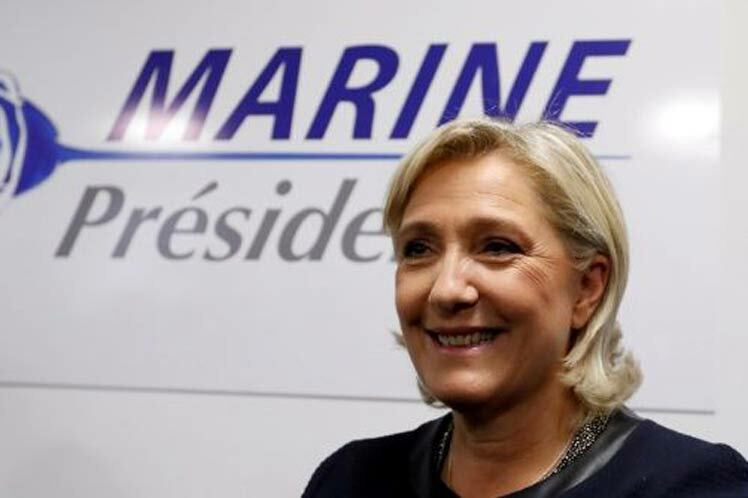 Some people who like Marine Le Pen are afraid of voting for her, fearing the “color revolution” sure to be mounted against her. Mélenchon and even Fillon might face similar problems. As a taste of things to come, on April 20, the EU Observer published an article entitled “Russia-linked fake news floods French social media”. Since a large majority of the eleven candidates, including three of the four front-runners, are strongly critical of the EU and of NATO and want to improve relations with Russia, it would seem that Putin wouldn’t have to make a great effort to get a more friendly French government next time around. On the other hand, the EU Observer article is only a small sample of blatant “interference in the French election” on the part of the globalists on behalf of their favorite, Emmanuel Macron, the most enthusiastic Europhile. – there is no way to improve the EU from the inside, because any change would require unanimity among 27 member states who disagree on key issues. – the only solution for France is to use Article 50 of the EU treaties to withdraw entirely, as the United Kingdom is currently doing. – only by leaving the EU can France save its public services, its social benefits, its economy and its democracy. – it is only by restoring its national sovereignty that genuine democratic life, with confrontation between a real “left” and “right”, can be possible. – by leaving the EU, France, which has over 6,000 treaties with other countries, would not be isolated but would be joining the greater world. Asselineau is a single issue candidate. He vows that as soon as elected, he would invoke Article 50 to leave the EU and immediately apply to Washington to withdraw from NATO. He emphasizes that none of the other critics of the EU propose such a clear exit within the rules. Other candidates, including the more charismatic Mélenchon and Le Pen, echo some of Asselineau’s arguments. But they are not ready to go so far as to advocate a clear immediate break with the EU, if only because they realize that the French population, while increasingly critical of the euro and alienated from the “European dream”, is still fearful of actually leaving, due to dire warnings of disaster from the Europeists. 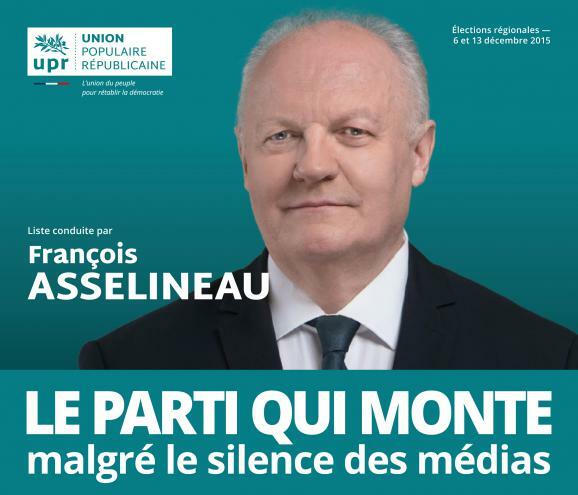 The first round campaign is an opportunity for Asselineau to present his ideas to a wider audience, preparing public opinion for a more coherent “Frexit” policy. By far the most fundamental emerging issue in this campaign is the conflict between the European Union and national sovereignty. It will probably not be settled in this election, but it won’t go away. This is the major issue of the future, because it determines whether any genuine political life is possible.